Increased performance - Harness the unused power of existing machines to create a large compute resource without the expense of high performance hardware. Improved research - Perform complex modelling and data analysis faster and with greater accuracy. Speed up time to market by reducing the wait for critical results and improving throughput at the testing and development stage. The Inferno Grid System minimises hassle as users can continue to use their existing applications without the need to modify or rewrite code. The Inferno Grid System can also control multiple jobs across several platforms without the need for different servers. Client capabilities ensure that platform specific jobs can only be executed on the correct platform. High Tolerance - The Inferno Grid System is resilient to client, server and network failures ensuring that jobs are completed in the shortest possible time with minimal computation loss. Highly Responsive - Stop, start and prioritise jobs with immediate effect across the grid. Once changes have been made, individual clients will start on their new tasks within a matter of seconds. No disruption to users - Processing for the grid takes place in the background using only unused resources. Users can carry on working as normal with no reduction in system performance or responsiveness. The Inferno Grid System can be controlled remotely and securely from any machine on the network, giving complete freedom to grid administrators. 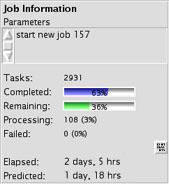 A graphical interface is provided to allow users to control and monitor the status of jobs and clients within the grid. Being able to see the grid at a glance and sort on any client attribute enables users to quickly find non-working or under performing clients. Vita Nuova can tailor the Inferno grid software to your individual specification as well as providing help with onsite installation and training. Contact us for more information. 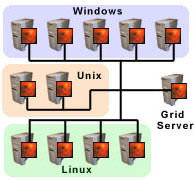 The grid server runs on any platform which supports Inferno (Windows, Linux, Unix and more). The server does not need to be running on the same platform as the grid clients. Restrict a job to a selected group of clients using include or exclude operators. Groups can be modified whilst a job is running with immediate effect. Step 1: A user submits a job to the Grid Server and optionally specifies a group of machines on which it is to be executed. Step 2: The Grid Server partitions the job into several tasks. Clients connect to the Grid Server and advertise their capabilities. If the client is capable of processing the task and is in the job group, it is handed the work. Step 3: Each client processes its task and upon completion, sends the results back to the Grid Server. Step 4: The user returns and collects the results, along with any error reports generated, from the Grid Server.